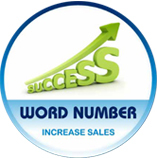 A Word Number is a 086 telephone number that spells out a word and can be dialed from both a landline or a cell phone. Your product, service or company name can now become your telephone number! A word number is a long term advertising tool that enables ease of expansion, marketing initiatives and/or changes of location. Should you have multiple branches a word number is the answer. Please note that each solution is specifically developed to each clients specifications and that the final costing is based on number of destinations, voice artist requirements, frequency of call reporting as well as the expected traffic which will be generated. Your company can now promote and brand one single telephone number which allows customers anywhere in the country to get hold of a branch, dealer or franchise of their choice. How? By presenting the caller with a series of Dynamic or Location based menus in order to ascertain exactly what and where the service is required. 1. Customer gets to the right place first time. 2. Replaces the expense of call operators. 3. Avoids mistakes made by receptionists/call centre operators. 4. You don’t lose out on sales due to inefficiency. 5. Consolidate all branch numbers into one number. 8. Service is available 24/7. 9. Routing to up to 180 destinations. 10. Allows for routing of landline and cellular calls. A word number and call routing solution can cost from as little as R 85 per destination per month. DON’T THROW YOUR MARKETING BUDGET DOWN THE DRAIN. MAKE DECISIONS BASED ON SOLID STATISTICS! AdWatchdog is a reporting system which allows you to track your incoming calls to adverts/advertising campaigns accurately. With a 086 word or numeric number/s provided by us you can improve your advertising quickly by knowing your ROI in real time. 1. Accurate decisions on future marketing spend. 2. Reduce unnecessary advertising expenses. 3. Build potential list of clients from the call report. 4. Allows you to predict consumer behaviour. 5. Monitor response to all branches/franchises. 6. Compare closing ratio to incoming ratio. 7. Monitor the success of your advertising agency. Ad Watchdog costs from R? Your product, service or company name can now become your telephone number! Why choose use our Services?